Hunters Bar Landscapes offer garden maintenance and landscaping services in Sheffield, South Yorkshire to domestic and commercial clients. 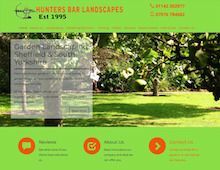 As part of Hunters Bar Landscapes garden maintenance offering, they provide a comprehensive range of services. So if you are looking for a gardener in Sheffield for grass cutting, hedge cutting, weed control, Hunters Bar Landscapes have a team of gardeners to assist. As well as this, Hunters Bar Landscapes are one of the top fencing contractors in Sheffield, and they are able to take on all types of fencing work throughout Sheffield and South Yorkshire. The garden landscaping team at Hunters Bar Landscapes offer a wide variety of landscaping services in Sheffield, from total garden design to patios, fencing and turfing. Artificial grass provides a low maintenance option for your home or business and Hunters Bar Landscapes can supply and install a variety of high quality artificial turf in Sheffield and South Yorkshire.Contact Hunters Bar Landscapes for a free quote on your artificial lawn today. So if you’re looking for a Gardener, a Landscaper or a Fencing Contractor in Sheffield contact Hunters Bar Landscapes today! They offer free quotes for artificial lawns, garden maintenance, and all landscaping services across Sheffield and South Yorkshire.